LeBron James is 6-foot-8 and 250 pounds. Isaiah Thomas is 5-foot-9, 185. 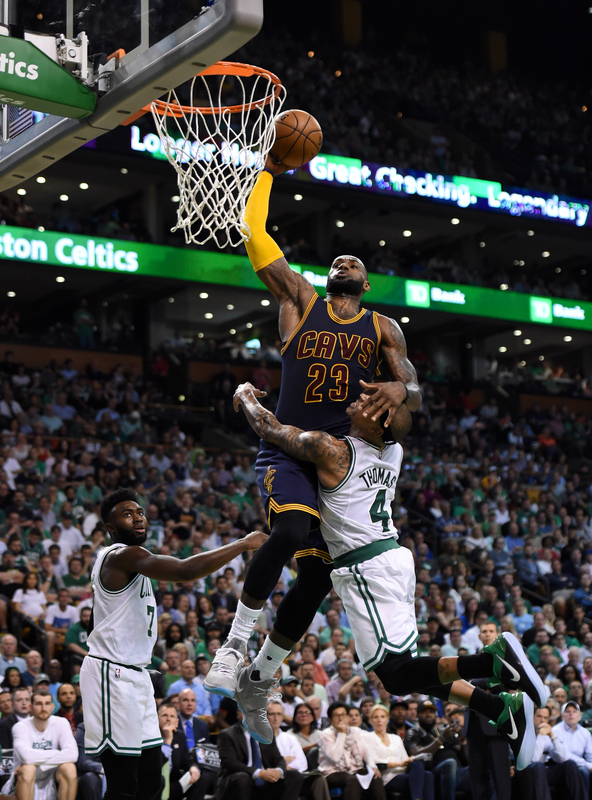 That’s an 11-inch, 65-pound difference that went toe-to-toe on one play late in Game 1 of the Eastern Conference finals between James’ Cleveland Cavaliers and Thomas’ Boston Celtics. With 9:47 left in the game and the Celtics trailing by 18, Freight Train James ferociously drove down the lane, and the small but mighty Thomas sought to stop him. In these few seconds, it was a battle of David vs. Goliath that ended in a draw. Thomas was whistled for a foul, and the contact James was met with changed the dunk attempt into a chance at an and-1 layup. James missed at the rim, so the play didn’t end in a bucket. But the moment could still be looped over and over again, or find its way onto a poster. It’s that addictive to watch, for so many reasons. Let’s break it down, from start to finish. What the video above does not show is James splitting two Boston defenders with a spin move to earn a clear path to the rim. As he headed down the lane on a straight line, Thomas saw the play unfolding from the free-throw line and made a lateral move to contest whatever The King had planned. James and Thomas jumped at the same time. The only thing is James’ vertical leap is “somewhere north of 40 inches.” Not many players would be able to match James’ athleticism in a moment like this. Surely not Thomas, a player a foot shorter than him. 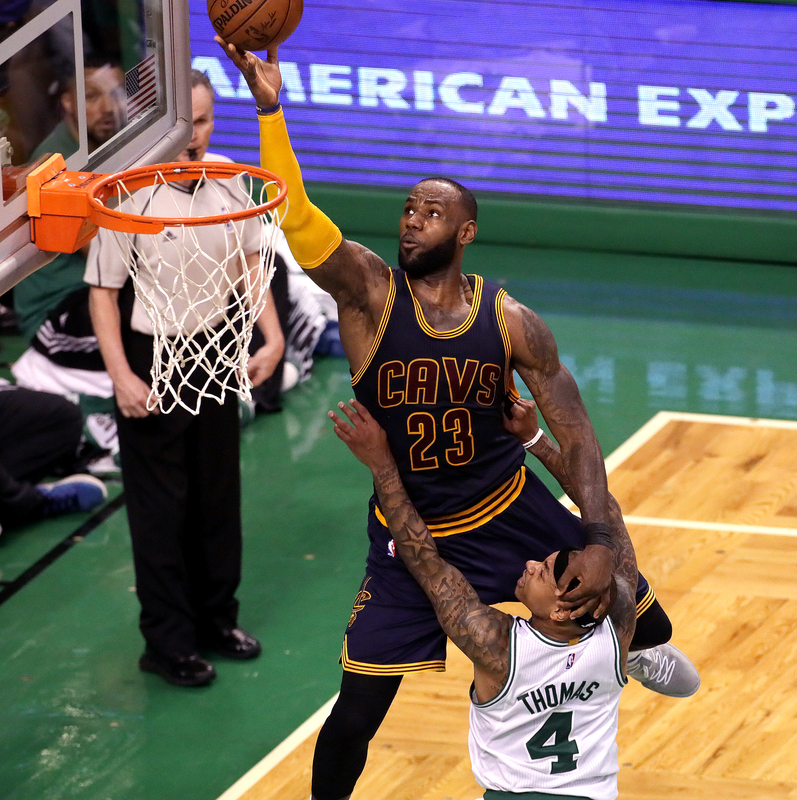 Boston Celtics guard Isaiah Thomas fouls Cleveland Cavaliers forward LeBron James during the second half of Game 1 of the Eastern Conference finals Wednesday night at TD Garden in Boston. Huge shoutout to Thomas for jumping with James. You gotta love the heart he plays with night in and night out. When their bodies collided at full speed, James absorbed the contact by instinctually closing his eyes. So maybe he was unaware of the disrespect that ensued. To hold himself up in the air as he continued his flight to the rim, he rested his forearm and hand on Thomas’ head. Bruh. Our deepest condolences to Thomas for that. James gets a little extra lift as he uses Thomas for some leverage on this fourth-quarter layup. The Cavaliers defeated the Celtics, 117-104, in Game 1 of the Eastern Conference finals Wednesday night in Boston. The basketball gods must not have thought that James using Thomas’ head as an armrest was enough. So, to add insult to injury, when the play ended and Thomas landed on the floor, his headband popped off, ending a sequence that felt like it was straight out of a cartoon and not an NBA playoff game. Thomas’ headband falling off was reminiscent of when James lost his in Game 6 of the 2013 NBA Finals. At least James got a dunk on that play. Don’t be surprised if James’ near baptism of Thomas in Game 1 foreshadows how the entire series will transpire: James and the Cavs will come at Thomas and the Celtics at full force, and no matter how hard they try, Boston won’t be able to stop Cleveland.